Tree by Work Sketch – Let's Paint Nature! I park in front of this tree every single day at work. It is one of several professionally manicured landscaped pines. Professionally landscaped…reminds me of a golf course. Uggh. I much prefer the rugged woods, natural and wild. I have omitted several business buildings in the background, by the way, who wants to see an industrial park? Not me. Never the less, wildlife abound. I have spotted robins, house sparrows, cardinals, juncos (in winter), and the ever happy goldfinches, resting in this very tree. Not only do the birds love it, but a family of rabbits do as well. How cute the babies (3) are in the morning hopping excitedly by mom under this tree, not even concerned that I pulled up in my car. They make my day at work almost bearable. Anyhow, on this day the atmosphere is changing…rain is coming. I love a rainy day…I don’t even know why. Sometimes, when we have several days of sun in a row, I feel crabby. In contrast, I admit, to normal weather reactions. The rain, mist, and or storms comfort me. What is it about a disturbance in the air? 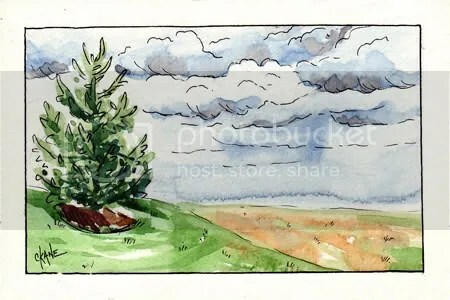 Ironically I did a pencil sketch of a tree near my shack at work once (I was a security guard & it helped kill time.) Yours came out lovely! Lana: Why work when you can do art! Priorities first! lol.